If a book doesn’t mention delicious amounts of food, I have to ask the difficult and dark question: is this book broken?? Look you all know I am quite fond of cake. It keeps us alive. 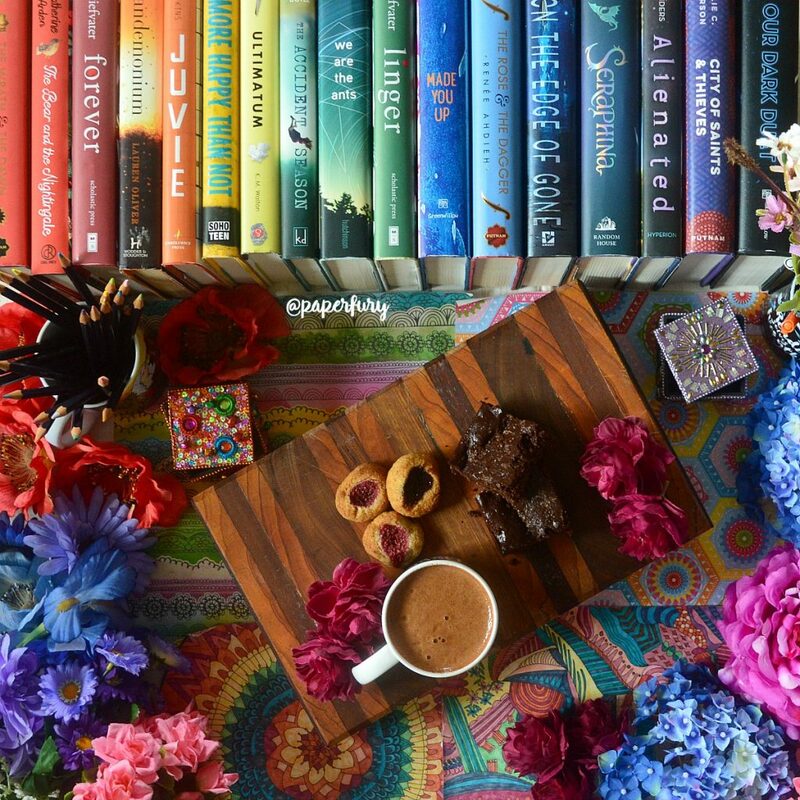 Books + cake = literally why the planet hasn’t broken down in tears and stopped spinning. So obviously in order for a book to be considered “good”, it needs to appear with copious amounts of pages dedicated solely to food. This is why cookbooks are a cut above the rest except for the fact they have a severe lack of dragons. Which is weird??? I guess they were just edited badly. YOU KNOW WHAT? WHY DON’T YOU JUST SIT DOWN, AND I’LL DEAL WITH YOU LATER. Because I actually have GOOD REASONS why books should talk about food. And I’ll list them for you with passionate indignation and cookie crumbs. * No no I don’t say this to all my followers. You are special. Believe me, I am honest once ever 17 working-days. 1. FOOD = RELATABLE. AND WE ALL WANT BOOKS TO BE RELATABLE. Much like napping, everyone has to eat = ergo it’s a very relatable thing to write about in books. But UNLIKE napping, it’s not excruciatingly boring to read about. I mean have you tried reading Rip Van Winkle’s autobiography? I fell asleep in the middle. Now obviously not everyone eats the same food so you might argue that this makes it unrelatable. BUT NO SIR YOU ARE WRONG, SIT DOWN. Food is pleasure mixed with need and it can be fascinating. * That moment when you relate to a sandwich more than a book but oh well. 2. IT IS 500% USEFUL FOR WORLD BUILDING. how do they grow the food? if they’re eating a lot of rice you can expect there are rice fields. if they’re eating a lot of children…IDK man what the heck are you reading about. how do they take their meals? do they believe in picnics? are they used to going without meals? 3. IT’S A GOOD THING TO PUT INTO THE BACKGROUND OF SCENES TO MAKE IMPORTANT DISCUSSIONS MORE INTERESTING. You know how boring long monologues can be so —> PUT FOOD IN THEM. There’s nothing better than a council meeting with the kings of the underworld while they’re also struggling with pomegranate on their crackers and dip. And you’re lying @ me if you haven’t read a contemporary where they all sat down to a FATED FAMILY MEAL that generally involved lasagna and emotional ruin. Basically having food carry on in the background makes a scene WAY more interesting. * SAYS THE ONE WHO PUT LASAGNA IN HER OWN BOOK. I CAN’T EVEN WITH ME RIGHT NOW. IT’S A CLICHE IN PAN. 4. IT’S ACTUALLY A WAY TO DEVELOP YOUR CHARACTERS MORE. Because everyone has food preferences. Or allergies too! I’m still waiting to see lowkey allergies in books because everyone can eat everything and I PROTEST THE UNREALISTICNESS. Like wow let me tell you about the time I went on a youth outing as a teen and put “Gluten Free” down on my form and I’m sure a group of adults put their heads together and asked, “WOW WHAT DOESN’T HAVE GLUTEN IN IT?? ?” And decided to just feed me apples. For 3 days straight. Well done??? I guess??? I didn’t die??? But I am damaged??? 5. IT CAN MAKE READERS DIE OF HUNGER. This is a positive since the world is over crowded so why not knock a few readers off with the power of your delicious foodie descriptions. I’m not saying go for it, but like…why not. 6. IT GIVES YOU INSPIRATION FOR DINNER. I’m not saying you’re LAZY or anything — but thinking up meals is freaking hard. So why not let your local YA book gently shove you in the right direction??? Plus then you can collect book-inspired cookbooks and the level of GEEKDOM right there is edible. read Strange The Dreamer —> you will want magical cakes from Lazlo’s brain which sounds weird but like I can explain….no. It’s still weird. BUT HE IMAGINES GREAT CAKES. Unfortunately you MIGHT die reading the deliciousness before you can make it. But that’s a risk you take. And natural selection of the fittest yadda ya and all that. 7. FOOD CAN CAUSE MASSIVE CONFLICT IN BOOKS. Um…yes, maybe the last one is autobiographical. DO YOU EVER WONDER HOW VILLAIN STORIES STARTED????? It was because someone deprived them of a particularly delicious piece of food. Q: are you still angry? Q are you STILL ANG– oh wait…no you’re not anymore. It’s fixed everything. It’s perfect reasoning. Absolutely no room for problems. This is why I’ll be a successful dark lord when I take over the world. 8. IT CAN CREATE GOOD FEELSY MOMENTS. You know when there’s the LAST piece of food and it’s given to the smol poor starving waif and all our hearts go, “AWWWWW!” Because sacrifice! Love! Bravery! I’m trying to figure out if this gif promotes sacrifice, love and bravery…but also maybe not. But you get my point. We will ALL love the character who gives up life (aka food) to protect the starving. Unless you’re Bilbo Baggins. Then you just get seriously annoyed when people take your food and like…#Relatable. 9. IT CAN GIVE YOU AN INTERESTING SETTING. Like people go all out setting their books in broken down warehouses or cold castles or schools — but WHY when you could set it in a bakery?? I ask the real questions here. I also am here asking for more magical bakeries but the world has yet to hear my demands. 10. HONESTLY FOODIE FICTION JUST MAKES ME HAPPY AND WHAT ELSE IS IMPORTANT IN THIS LIFE. I’m not saying the world revolves around me…but I’m not saying it doesn’t. Look I even have a Goodreads shelf devoted to foodie fiction. And books I read genuinely go up a star if they are full of food. Like recently I read Kids Like Us and the sheer amount of FRENCH PASTRIES AND CAKE AND RHUBARB JAM actually gave me life. Add food into all the books, I say. Make it relatable and make us hungry and make us FEEL ALL THE THINGS. And then could someone please open some book-themed restaurants and bakeries because I want to buy November Cakes and butterbeer??? If I’m going to leave the house, ALL I’M SAYING IS, this would be a good idea. TIME FOR SOME OF MY FAVOURITE FOODIE BOOK RECS! I’m being pretentiously clever here and these book covers will rotate when you hover over them. Because flipping books is too much fun, OK??? And also click on them to go read my reviews! I’d love you to click on them and — BOOM — the food appears, but my blog isn’t up to there yet. My magic is still growing. Set in France and SO MUCH FRENCH FOOD. Pastries and croissants and rhubarb jam and madeleine cakes. Plus it's about autism with a great rep! The kids in this book don't know how to cook main meals so: it's all apple cake and November cakes DRIPPING WITH HONEY. All Snake does really is eat strawberry liquorice until everyone wants to kill him, but it's endearing and I love him. Also about depression!! AND SO GOOD. This is about a boy who's little bro is dying but EATING MAGICAL FISH can save him. Also sad smol queer merboy who will die if you eat all the fish. The sheer amount of Mexican food is DELICIOUS and I nearly ate my arm. Also super sweet platonic friendships! It's Benjamin Alire Sáenz, c'mon he is MASTER. He imagines the PRETTIEST CAKES in his dreams and also just ALL the foodie descriptions were fantastical and vivid. Also monsters and mayhem and soft cinnamon boys. About Russian fantasy + magicians + DARK SIDE. And one of the magicians makes an edible Christmas tree so like wow here I am. Historical fiction about aftermath of an earthquake and they have a pop-up restaurant and IT'S AMAZING. POC protagonist and #ownvoices and food tho. I didn't *love* it but it IS set in a magical world where you can bake feelings into cakes and manipulate people which 10/10 would love that skill. Fairy tales! Aussie YA!! #Ownvoices for Greek culture and SO MUCH GREEK FOOD you will literally thank me after you read this. So full of cake I can't even with how much I love it.😍Lara Jean is your #1 baker and ALL THE CUPCAKES. Also super sweet Korean sisterly story! righto, recommend me your FAVOURITE FOODIE FICTION!! because i have need. and what did you think of my list?? any other good reasons to mention food in books? what bookish food would you like to try in real life??? I loved the food in The Crown’s Game! I don’t think that I notice food very much in books…but I did make spicy lentil soup and fresh corn cakes for lunch today. I like Chocolat by Joanne Harris because it has a lot of chocolate. All of these reasons are good ones! I love how food can showcase a culture and a character’s understanding of the world they live in. I would love to eat november cakes (actually, Shar made them one time) or maybe just a Harry Potter feast. The Crown’s Game duology like WINS for the amounts of delicious food. Like didn’t Vika’s chapter start in a bakery??? Bless it for its amazingness. And food can make a book so iconic! Like Harry Potter’s butterbeer! Oooh nice! You went all out on this post! Love how you can hover over the covers and they flip with whatever tasty treat was inside! Totally awesome! Great post too by the way! Found myself agreeing with it. And yes, writing this post made me sooo hungry! And I had been writing it before dinner, so I was starving actually! LOL! This is such a fun and fabulous list. I love what you did with this week’s topic (I sadly, crumbled under the pressure, cheated and did last weeks topic instead). I would love to read a fantasy book set in a world where they are dead against picnics- I’ve definitely not been to a world like that before! I’ve always loved the food in historical fiction, which is surprising because I thought they’d spent months scouring the countryside for berries, but according to Kate Quinn’s book the ancient Roman’s knew how to throw a feast! This was perfect. I often question why there isn’t more food in books. If I am not hungry after eating has the author really done her job? I am now going to immediately get Kids like this just because of the large amounts of food involved. Exactly right??? It’s so questionable. If I don’t feel like devouring the pages then WHAT EVEN ARE THEY HERE FOR. This is absolute truth. I mean is it even a real Australian book WITHOUT TIM TAMS. Ok, so I have a theory about why contemporaries like to use lasagna so much. Well, it’s not so much a theory as a list of ideas, but yeah. -It’s something literally anyone could make. All you need are the right kind of noodles, some tomato sauce, some meat, and some cheese and you’re good to go. You don’t even have to use the fancy ricotta cheese if you have the right recipe; my mom makes a lasagna with cream cheese and it’s actually the best thing ever. -When made right, it’s extraordinarily delicious, but unless you’re a crazy person who dislikes melted cheese, there are no random acquired tastes. -Because it’s extraordinarily delicious, any meal featuring lasagna should be a joyful occasion . . . which just ups the tension/drama/whatever when the meal is ruined by DRAMA and CONFLICT and ANGST and WOE. Also, maybe I’m going out on a limb here, but have you read House of Many Ways? Because it’s very much a food centered book. I’m pretty sure there’s mention of some kind of deliciousness every other chapter at least, possibly every chapter (or very nearly). Most of the major characters are very fond of good food and books, sometimes at the same time and sometimes not, so, yeah. The MC can be a touch aggravating at times, but generally- yes. I’m so glad you’re writing a magical bakery!! I’ve only read one book with it and that’s like not nearly enough??? It needs to be a whole genre: FOODIE FICTION. Danke. 😀 And I’m sorry. If it makes you feel any better, your post made me crave waffles for some reason, so . . . yeah. I’m not writing one right this minute, but I will write one sometime. And YES, it totally should. Or a subgenre at least. We should make it a thing. Not exactly food fiction, but thought you might be interested in this: https://www.amazon.com/Mystery-Writers-America-Cookbook-Wickedly-ebook/dp/B00N6PBELA/ref=sr_1_1?ie=UTF8&qid=1508240840&sr=8-1&keywords=mystery+writers+of+america+cookbook I have a copy somewhere at home. Just read this list thinking Robin McKinley’s Sunshine had to be coming up next because there was no way it couldn’t be there. And then it wasn’t! It’s the first thing that comes to mind when the subject of food in books comes up and will definitely leave you craving cake! The main character’s a baker who specialises in inventing gothic desserts in between figuring out how to deal with vampires! And with a signature dish of cinnamon rolls as big as your head. so i’m re-reading the eragon series and they have some very nice feasts, and in book two he cooks this absolutely delicious sounding rabbit and look out little sis your pet rabbit might disappear soon. Redwall books have the most amazing food in my opinion. Since they’re animals, they don’t eat any meat, but the wonderful foods they make from other things make up for it. I get hungry every time they mention a food in those books. I don’t think it’s a book when food is not mention. As you pointed out food is important without it … Nah, I don’t want to think about that. Especially is a must when characters are having a serious conversation or in almost any situation to give it a little bit of color. Almost because I don’t need food in a fight scene because it’s precious, and there is another purpose for it, not to be splat in someone’s face. Even tho that would be kinda funny. I love books about food. I run a monthly link up for books about food. You are welcome to link up your post at http://www.spiritblog.net/october-2017-foodies-read. We have a monthly giveaway for books about food awarded by a draw from all the reviews posted. It is a great way to find out about all kinds of other books that will make you hungry. AWw that’s really awesome, Heather! I’ll have to come check it out! Okay but NO LIE I’ve craved so much food and figured out what to eat next based on what I was reading. Totally devoured some waffles for breakfast after Crooked Kingdom and begged my dad to buy Oreos while I was reading Simon. I also sneakily convinced my parents to make homemade tortillas with our tacos because there are so. many. tortillas. in The Inexplicable Logic of My Life. I’m doing my best to keep lots of food in my books but sometimes it’s hard when they’re, you know, fleeing bad guys and trying to stop the apocalypse. But there’s always Chinese takeout along the way. I want waffles and ice cream SO BAD after reading Crooked Kingdom.😂 Nina is also me when they ask her to share food and she gets so freaking offended. Bless Nina. She is the person we all need. (And I’m still working on my family with the tortillas because of Inexplicable Logic. BUT I WILL PREVAIL). Great post as always! In my debut YA book, The Secret to Letting Go, my heroine is staying with the hero’s grandmother. The hero comes by every day to help his grandmother with mowing the lawn, etc and keeps popping in the kitchen to check out the heroine’s baking. It’s a very sweet part of their relationship. In my latest WIP, my main characters have a running theme with Skittles. It’s a slow burn relationship, They keep talking about how they shouldn’t be friends, but then somehow a bag of Skittles is exchanged:) And the reader knows there’s more going on! 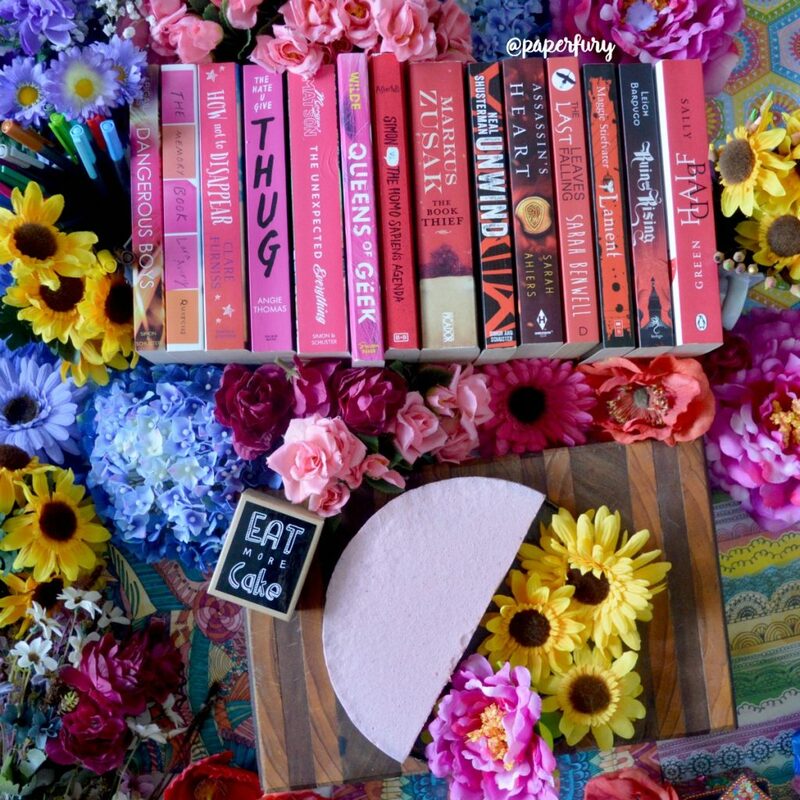 So, yay for food in books!! My copy of The Scorpio Races has a recipe for Novemeber cakes in the back and I made them last November and they are delicious. You have to eat them hot, though, or they get all weird and soggy, but that just means you can plow through the entire dozen cakes in like an hour alone. The perfect excuse! And I like using food in fantasy novels to help show what countries and cultures my kingdoms are inspired by: My NaNo novel has a lot of croissants and black coffee and bread and cheese, so France, in another one I’m outlining, one of my MCs adores egg custard tarts, and another one always has a stash of little rosewater shortbread cookies and these almond-filled pastries called qottab. Delicious and world building at the same time! Omgg I’m so jealous.😂 I want to make them but I’m allergic to honey (trying to figure out if you could use like rice malt syrup or something instead?). I am already IN LOVE with your NaNo novel, I have to confess. Like it makes it more special when it’s not like just all typical food. Like rosewater shortbread cookies sound so aesthetic and delicious?? I’M A FAN, AINE. Keeper of the Lost Cities. I mean, ALL THE FOOD. THAT SEEMS UNFAIR TO OUR POOR STOMACHS. Love it! I so agree that food scenes help make characters more relatable and therefore I will like the entire book more… it’s strange reality… I mean when I get together with my friends there is always food, or at least a drink, so it makes sense that my books should understand this need for food as part of the picture. Yes I know! Did you know there’s a Game of Thrones cookbook too?! Food in books just makes me hungry. So does food on TV. And food at the grocery store. Basically, I’m just hungry all the time. I love the Oreos in Simon Vs because Oreos are the best. Ya I relate here. I mean grocery shopping is just rude. All that food and we’re so hungry omg. i’m laughing because food has become quite a major thing in all my novels by now. also your point about low blood sugar, oh gosh. i read a tiny bit of research that said “researchers have possibly linked hypoglycemia to murder” so now my assassin character has it for my own amusement. aLLERGIES IN FICTION YES. the #1 source of petty conflict in one of my WIPs is “yes i’m allergic to peanuts but i am iNVINCIBLE’ and this causes Assassin Friend to be Angry Mom Friend because no. we 10/10 need more delicious food in books because it makes me so hungry and it’s delicious. THIS IS GOOD. I AM PLEASED AND PROUD. And omg I literally have a character who is SO cranky and they feed him and it’s like *SNAP* he’s such a nicer person after that.😂 I think we need to acknowledge things like low-blood sugar and allergies more!! Hahah. I love this post! As someone who loves to cook (and eat) I find food in my stories a major plus! Although, I did have a love/hate relationship with the Stephanie Plum books by Janet Evanovich for many years… mostly because TastyKakes were unavailable on the West Coast. Although I’d never had a Butterscotch Krimpet, I knew I needed one! I thought this post was going to be just you screaming “CAKE IS LIFE PUT IT IN BOOKS”, which I would not have argued with, but this was actually a very lovely, convincing post. I’ve already added some food to my books, but after reading this, I am adding ALL THE EATING. Plot? Who needs plot. MORE TIME IN THE KITCHEN. Honestly less plot = more food. Nothing can go wrong. My NaNo project currently has a very pivotal scene where a boy gets stuck on a roof in the rain but won’t come down because he won’t leave his cupcakes behind. HARRY POTTER WOULD BE WEAK AND FEEBLE IF IT DIDN’T HAVE ALL THE DELICIOUS FOODIE SCENES. THIS IS FACT. Sean Kendrick just needs to show up in every book armed with a loaf of bread. Bread + cute horsey Irish/Scottish/ish boy = happy readers everywhere. PROBLEM SOLVED. Also, I’m reading Crooked Kingdom at the moment, so thanks for the heads up about the waffles; I shall adjust my breakfast plans for the next week accordingly. Also also, that midday nap after lunch thing is real. It’s called a siesta and it’s alive and well in Latin cultures. I think Middle Eastern cultures also have a similar equivalent, but I don’t know what it’s called. Basically, if you’re hanging out somewhere and it’s flipping hot around lunch time, chances are everyone believes in nap time, to sleep through the hottest part of the day. I just think Latinos took it to an art form, like everything else they do. I mean hello, have you seen their cemeteries? ART. And there’s nothing wrong with lasagna. Garfield’s life was saved many a time by the miracle of lasagna. I CAN ONLY AGREE VERY PASSIONATELY ABOUT THIS FIRST STATEMENT. Basically just put Sean Kendrick everywhere. The world will be a better place. And yes, haha, I do know about Siestas.😂 I wish the world would take it though, like why isn’t that something we can all adopt??? I WANT TO NAP WHEN I WANT. I’m not going to lie-my books all have about 200% more food in them now that I’ve been reading your blog. I used to be one of those sad, sad people who didn’t really give food too much thought when it came to reading, but now?? Now every scene I have to sit back and wonder, ‘Can someone be eating right now?’ It’s quite scary. It’s also quite delicious. Seriously?! Omg this maKES MY DAY.😂My work here is done. Bahahah. But like it’s so important. If we’re not asking ourselves: can this scene be improved with food? ThEN WHAT ARE WE DOING. Foodie Fiction should totally be a genre in itself.. Or maybe it already is?? Like, I can’t be trusted to know these things.. And when it comes to reading books with crazy amazing food in them, my go-to is ALWAYS Harry Potter! I love how you made a really convincing argument for this! I agree all books should have food, it only ever makes me love them more. OMG THAT SOUNDS AMAZING!! Why haven’t I heard of it before now?! My favourite foodie book is The Indigo Notebook series. It’s so full of all this delicious sounding food. I agree, I also want butter beer and November Cakes! They just sound so GOOD! Ooh I definitely want to look that up now!! All of Brian Jacques’ Redwall series (cute mice fighting rats and etc in their own castle and etc, so good) has a MASSIVE load of food that never gets boring cause its all brand new stuff and ingredients like dandelion tea with sugared somethings. EVERYONE in the books is good at putting food together. Of all the books with food in it, I’d say the Redwall series and the Heartless book make me the hungriest FOR SURE. I keep getting recommended the Redwall books and I NEED TO READ THEM. You’re also totally right about the lack of food allergies in fiction! Quick story of my life: I’m not allergic to any food, but my husband is allergic to tree nuts. So I’m all like, that’s fine, I hate nuts anyway. No big deal. Except that wallnut shell is in my lotion, almond oil is in my shampoo, hazlenut is in my nutella, and oh that ice cream place uses the same scoop for chocolate AND butter pecan, and oops that brownie had surprise macadamia in it and now I can’t kiss my husband for a week. UGGHHHH. dang it, girl, where is your like button? I genuinely don’t understand why books don’t mention food more, for all the reasons you mentioned and more! Heartless was probably my fave “foodie” type book I’ve read because I finished it feeling so hungry! The Crown’s Game was also awesome for food, so I’m glad to hear The Crown’s Fate continues that. I actually did my entire list this week about food I wanted to try from books, although it took me a while to remember which books actually have food. I honestly think I should just live in Madame Fanina’s bakery. THIS POST MADE ME SO HUNGRY, so I just casually moved my bed to the kitchen and now all it’s right with the world. And yes with the greater food restrictions diversity, because what’s more fun than making your character look at other people eating the most delicious food while having to eat celery. Fun fun fun (no I’m not still bitter about the time this happened to me). So thank you for pointing out all of theses, well, points…meaning while I’m having a fun time DYING OF LACK Of CUPCAKES..but no worries, I’m baking some as we speak. You must read The Storyteller by Jodi Picoult!!!!!!!! One of the motifs is literally bread. IT. IS. AMAZING. I have that one on my tbr for one day!! BREAD IS GREAT. Oh yes it’d be good to see vegetarians more too! I have a total vegetarian culture in one of my fantasy books because I think it’s something that needs to be in books more! OH GODDD, NUMBER 4!!!! Is it possible that I can relate to something THIS MUCH? I’m gluten intolerant as well, ad EXACTLY the same thing happens to me all the time on school trips. During the first time after I had just found out about my allergies, I was fed potato and apples all throughout. I have fruits for breakfast, and also for basically anything else accompanied by other stuff because I love them. The only thing I had asked for was a goddamned apple. I didn’t have breakfast for two days straight until they were able to find a freaking apple and banana. My snacks all consisted of this tree fruit because all they had for the other kids were chocolate and caramel cookies. My teachers had to pay for the apples instead of the service providing them, and they only bought ONE AT A TIME because they didn’t want to waste their damned money. And I was like, guess what? I don’t eat only one apple a day. DO YOU EAT ONLY ONE FOOD A DAY? No no, I don’t think so. I didn’t die either, but it was all thanks to a glass of water every morning and almonds that I, MYSELF had taken. I’m going to write about a gluten intolerant main character living in a fantasy world with dragons, cake, victory, magic AND also introduce the world to the wonders of rice flour, quinoa, millet, and all the beautiful foods that I love. Not only potatoes. We do not only eat apples and potatoes. My main character will sit to have dinner and I will describe all of their glorious food with the most detailed of details. PREPARE TO DROOL! PS: I wrote for the first time a segment of my WIP and I’m really liking it. I participated on this feature called 15 Minute Ficlets hosted by The Literary Phoenix where you have to write something under 15 mins (doesn’t even really have to make sense) and be related to a random word you come up with. You should participate to share more of your gorgeous writing / WIPs !!! And omg yes please do put gluten intolerant people in fantasy worlds!! Oh I know the Literary Phoenix! I shall check out the linkup! CAIT YOU ARE THE FOODIE LIT QUEEN. And honestly it’s… lit? I???? NO BUT REALLY. Swoon, I should have just tweeted you and been like HELP ME FIGURE OUT FOODIE FICTION because apparently me + paying attention to food in books is not always a good combo. I mean, who let my brain poop out on me???? Real talk though, this list is great. You’re great. You know what else is great? The cake that I just made for my friends birthday. -Carry On makes me want SCONES. -I AM THINKING A LOT ABOUT THE IMPORTANCE OF FOOD IN FICTION NOW. -Can Cath in Heartless give me her recipes. That’s it that’s my comment. I honestly can’t wait to build the cultures in my book for NaNoWriMo so I can put so much mouthwatering foods int them. Is anyone else excited for NaNoWriMo? It’s in 13 days, guys, ONLY 13 MORE DAYS!!!!! I’M EXCITED FOR NANO. I have SO much food planned from my book haha. It’s a contemporary but fantasy-food-cultures are WAy more fun to build. So I hope you enjoy yours!! I’ve missed your Top Ten Tuesday posts. I’m glad you’re back. I can totally relate to the stolen chocolate incident. I still won’t let my best friend live down the time we went camping and she put herself in charge of rationing our food and water only to consume it all herself, leaving the rest of us to die of thirst and hunger. I mean, it really wasn’t a bit deal, but it totally was! I’m pretty sure I’ve been doing the TTT posts every week?😂 But thanks for reading! I really appreciate it! One big reason – taste is a sense. Describing what characters are eating can make a reader actually feel like they’re eating what they characters are, making it easier to put themselves in their shoes. Good fiction is a feast for all the senses, not just the eyes. Recommendations – any book set in Italy. It seems to be a requirement that it’s characters eat a copious amount of gelato. Yes absolutely! 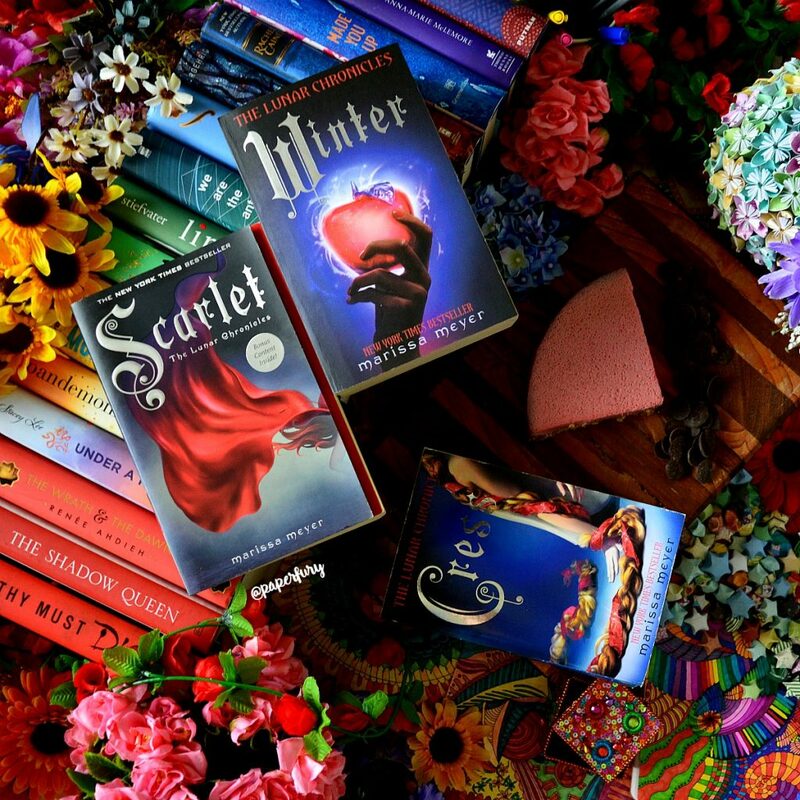 It’s about the visual, sensory, and textural experience too when it comes to books! You made me hungry after this delicious post! (see what I did there?) But seriously food in books makes everything in the book better. As for #4, Frank in Percy Jackson was lactose-intolerant and was nice to here briefly about his bad gas issues… sorry that was weird. Thanks for the wonderful post Cait! Ahh I actually love your flippy book covers so much. The jealousy is real *concentrates really hard to see if my own blog with magically evolve*. ALSO YES TO THE WAFFLES IN SIX OF CROWS. I just finished Crooked Kingdom and I was like, my god, there are waffles in every chapter, I’m sure. Whenever I lovingly re-read Tiger’s Curse the cravings for Indian food are SO REAL. It is always so utterly disappointing when characters don’t eat in books – all character should be like Ron Weasley and eating all the time. it is the only way to be. And omg there was so many waffles in CK and like when Nina got made that she had to share food? RELATABLE. I have to admit that when I read that this was this weeks top ten tuesday meme, I immediately thought about your blog! I thought; how many times will she mention the word “cake” in one post! It was a great post (like all your posts)! Now I’m hungry because of this post and I’m probably of to a bakery to get me some cake for myself! This post made me smile, Cait! But I’m not really that bothered if food is in books or not. I’m a very fussy eater, so most of the time when food is mentioned, I scrunch up my face in disgust. There is never enough chicken in books. Lol. But yeah, I don’t really pay much attention to food in books, so I can’t rec many. Though there is always food in fantasy novels. Robin Hobb has a lot of food in her books. by people who are basically nerds in cooking, because they extracted they recipe from the little information GRRM gave and then made complete recipes out of them. It seems like, food is mentioned a lot in A Song of Ice and Fire, if you people stabbing each other for fun. I heard say (by which I mean, “I read on a blog”), when GRRM heard about this, he went like “Huh?” and admitted that he liked to eat but actually had no clue about cooking at all. Also, some of the recipes are “medieval style” so they only contain food that would have existed in the middle ages. I still remember the time when I went completely addicted to chocolate and couldn’t stop anymore (since back when I was seven I haven’t stopped being addicted, I guess) after I had read “Charlie and the Chocolate Factory.” We went hiking and there were foodstands all over the mountain (like it is in popular hiking areas) and my grandfather had to feed me at least one bar at every one of these. Dove chocolate. Do you still remember the stupid, awkward comment I once wrote on your goodreads about Harry Potter and the Half-Blood Prince? If it just vanished between tons of other internet stuff, skip the following question, if yes: do you still feel anger about that? I still feel anxious and guilty about it. It was regarding psychopaths that came out of not really knowing what psychopathy was and then believing it was something rather harmless. Which, you told me angrily, it is not. I don’t remember the rest. I think I already left a cheesy apology back then, that I don’t know anymore if it was worth anything. I think it’s definitely wrong to not do at least basic research on a topic before having a too strong opinion about it (I don’t think it’s wrong to have a vague opinion in the least ot at least HAVE an opinion about the little things you know) and that’s what I did. I guess if you look it up again it will cringeworthy a lot. I admit, I’m not doing this completely without an agenda or out of blue, because I’m thinking about participating at “Beautiful Books”. Are you okay with letting a very stupid person who always wants to be Matilda, or Hermine or Eowyn but sometimes questions if she also has some Peter Pettigrew and Joffrey inside her- anyway, if you’re okay if I participate in your link-up? It doesn’t feel right to just paste the link in (as of now, I haven’t published anything yet either). I love your blog and the questions in beautiful books are part of the reason why my short attention span came back to NaNo again, also my mind burst because of the ideas it gave me -may I? You are most welcome to join in the Beautiful People link up of course! It’s open for anyone. I am literally gonna show up at your front door one day and hand you cake, then hopefully talk you into letting me read all your books. PLEEEEEEAASE!!!!!!!! I remember you bringing this up in a blog post a couple of years ago and every single time I read a book and there’s no mention of food I’m reminded of you asking why no one is eating. I mean, if you’re adventuring and battling dragons, you gotta be hungry, surely? Oh wow I can’t believe you remember that post!😂 I totally plagiarised myself a bit here but I figured no one would notice haha. (I should’ve known you guys would have a better memory than me.😂) And absolutely yes: food makes everything more realistic. Like how am I supposed to believe they’re doing all this epic stuff with no snacks. I’m SURE you’re actually craving a woolly mammoth. C’mon now. Seems tasty. I really want nachos too actually… I’m trying to convince my family we need them in our life. They aren’t very receptive so I might be leaving home, idk. OMG I JUST SAW YOUR POST ABOUT YOUR BOOK ON TWITTER AND I’M TOO EXCITED TO CONFORM TO THE STUPID 140 CHARACTER LIMIT SO I’M COMMENTING HERE!!! I’ve only been reading your blog since February and I’m just so happy for you and you have been such an inspiration to me this last year and I love reading snippets of your writing and I just can’t wait to have a whole book! THANK YOU, HEATHER!! I’M SO FREAKING EXCITED I CAN’T EVEN.😂And I’m like beyond honoured that you want to read it! YOU’RE AMAZING. I’LL GIVE YOU ALL THE CAKE. Also I really hope you do NaNo! I will be here to cheer for you ahhh!!! And it is VERY ironic that I’m a contemporary YA author.😂Life is hilarious. But there is cake so like…at least we still know it’s still by me. I SO agree that more food needs to be included in YA!! I never thought about how it could relate to the worldbuilding of the novel??? BUT IT DOES. I think having food in it just makes everything more relatable and interesting and actually REALISTIC… because people really can’t survive on just one chocolate bar a day. (Altho chocolate bars sound very nice.) I’ll definitely have to check out some of the foodie books you recommended, especialluly The Scorpio Races! I love food in books!!! Except that it makes me super hungry and whatever they are having in the book is almost never something I have in my house, but whatever, I make do. But yes! 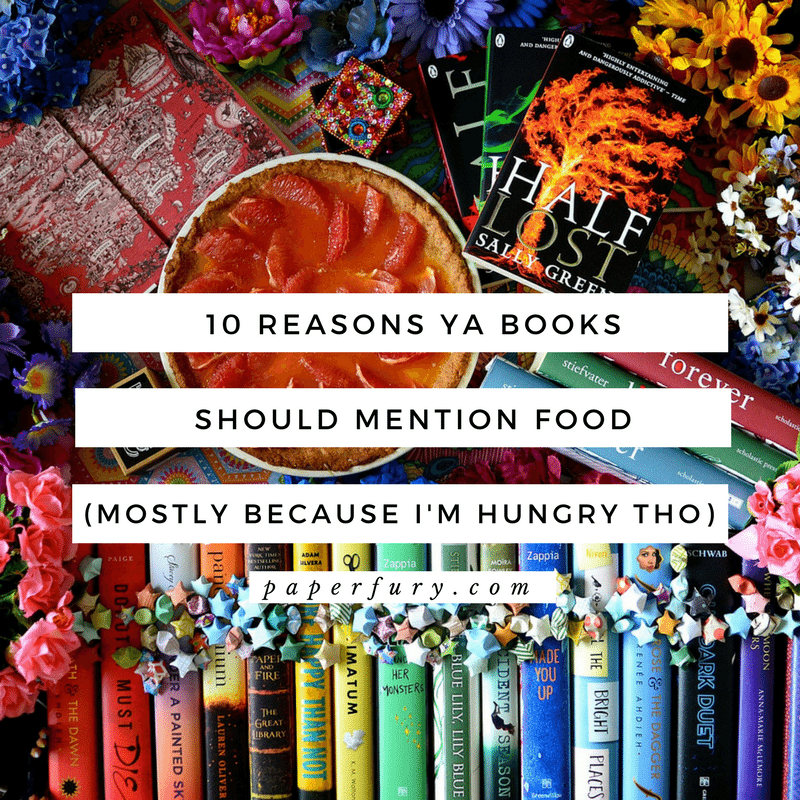 All the reasons you mentioned are amazing reasons to have food in books. Plus, it’s just realistic. People don’t necessarily spend a ton of time just sitting and staring directly at each other while they talk…but people do spend a lot of time talking over coffee, talking while they make dinner, getting lunch together…so, yay for being realistic!! And I always get so so hungry whenever I read the Harry Potter books probably because it seems like they are having a FEAST or some other great magical snack like every five pages. And then we like accidentally eat the book. GOOD TIMES.😂😂 And yes it makes like “boring” scenes more realistic/interesting if you have like a meal in the background. I’m way more invested in those scenes when I’m reading. Omg I want to eat those Hogwarts feasts so bad.